This gorgeous, flavorful eating orange has the perfect balance of sweet and tart. Easy to peel and enjoy, it has a long history of popularity in Florida and around the world. The Temple Orange is a medium-sized fruit with a glossy, orange-red peel. It has a different shape than many oranges: rather than being round like a ball, it&apos;s “pudgy” in the middle with a flatter top and bottom. Spicy-sweet, with a hint of sparkling tartness, the Temple is one of the more full-flavored, complex citrus fruits you can buy. Did you know that Temple Oranges aren&apos;t technically oranges? They&apos;re actually a hybrid of a tangerine and an orange, which gives them a great taste somewhere in between the two. The Temple Orange is medium-juicy...never dry, but not so wet as to be messy to eat. Temples are a famous and beloved variety that does come with some seeds. Temples are a classic, tender, well-flavored eating orange. They&apos;re very easy to peel, and segment up beautifully. 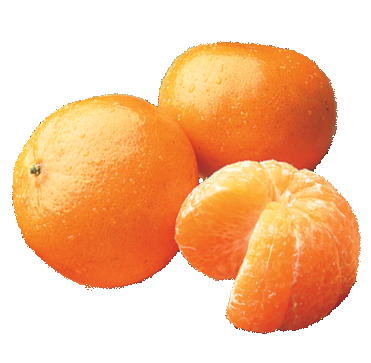 Temples are a mid- to late-season orange, available from late-January to March. They&apos;ll still be fresh off the tree in early spring, ready to ship for beautiful gift baskets when many varieties are long gone. Some people mistakenly believe the fruit got its name due to being displayed in temples. However, the Temple Orange is actually named after William Chase Temple, a Florida citrus grower who once owned the Pittsburgh Pirates baseball team. There are many different subtypes of Temple Oranges, also called “tangors” (for their parents, the “tang”erine and the “or”-ange). Some have pretty interesting names--for instance, King of Siam, Umatilla, Miyauchi Iyo, and Iyokan. The Temple is thought to have first been discovered in 1896 in Jamaica by a Florida fruit-grower by the name of Boyce. Boyce shipped some budwood (budding branches that are ready to be grafted to another tree) from these trees back to Florida. The resulting fruit eventually came to the attention of William Chase Temple, a prominent citrus grower and merchant. After the citrus fruit began to be grown commercially around 1919, it was given Temple&apos;s name.